Q&A: How were people saved before Jesus came? Having Scripture as our guide, we get that Jesus is the way to salvation. He said, “I am the way and the truth and the life. No one comes to the Father except through me” (John 14.6, NIV). But what about the time before Jesus came? How were people saved then? It sounds strange, but they were saved the same way then as we are now: by God’s grace, through faith. How was that possible? Listen here to find out. This message is based on Hebrews 11.1-12 and John 8.31-59. There are other questions that are involved, of course, especially as it relates to the place of the Jewish people in salvation history, but grace and faith remain the criteria for salvation. Some parents are better known through their kids! When I was a kid, I think my folks must have gotten royally tired of being referred to as “Jeff’s parents”. While they were proud of me (and still are, I think! ), I can imagine that they might have appreciated being able to enjoy their own identities a bit more. Let me tell you about Monica. She was less famous for who she was than for who her son was. She was one of those moms who became identified with her kid instead of being just who she was. She worked hard to raise her son in the Christian faith, despite having a husband who would not support her in that endeavour. Even later on, after her son became a believer, and he fell into error, she never spoke a bad word about him (even though she would not welcome him in her home while he was living in error). Her persistence paid off. Not only did her son return to the faith, but her prayers for her husband saw him come to faith in Christ as well. Monica was an ardent servant of the Lord. In fact, the Church of Rome saw her as such a hero of the faith that it beatified her. Yet we have no clue, generally, who she was. Augustine wrote of being able to be with his mother in her dying days, talking about the things of God and enjoying each other’s company. She was able to taste the fruit of her labours from her child-rearing days, and he was able to sit in the presence of one who had lived her whole life in the shadow of the cross. Now, when I think of Monica, I will think of moms everywhere who have laboured hard to raise their kids to be followers of Jesus. Nowadays, in my home town, the tide has turned. When I go back to my parents’ place, and I meet someone new, the response tends to be “Oh, you’re Judy’s boy!” or, “You’re Roy’s son.” And that’s all good as far as I’m concerned. “Honour your father and your mother, so that you may live long in the land the Lord your God is giving you” (Exodus 20.12, NIV). Q&A: What’s the right church? Alliance, Anglican, Baptist, Lutheran, Presbyterian, Roman Catholic, etc., etc. – with so many different denominations (and that’s not an inclusive list! ), how can we know what’s the ‘right’ church? In this message, based on several Scripture passages that are read throughout the message, you’ll learn what are six important biblical criteria to look for when choosing a church family with which to worship. have community as its key. To learn more, listen to the message by clicking here. Did you see the Perseid meteor shower last night? Apparently, it peaked after we had gone to bed, but we sat outside with our neighbours and cranked our heads skyward. I guess the bugs must have been watching, too, as none of us sustained any mosquito damage! What we saw was more like a few drips than a shower; the peak time, we later found out, was revised to sometime in the middle of the night (eastern time). Hopefully, those who waited up were rewarded. Thankfully, it was a clear night, and we saw more stars than we could count (as well as a few satellites and several airplanes that were hindering our view). Being able to see this tiny slice of the universe never ceases to remind me of both how insignificant and how significant I am. Here’s the deal: God is the Creator of the universe. He made the whole thing – he flung the stars into space! And the galaxies are numerous – more numerous, I’m sure, than science has yet found. God made them all, and he rules over them all. That’s a pretty big deal. But along with that, we believe that God made the earth as part of his creation of the universe. And he made humanity as his crowning achievement: we are the pinnacle of God’s creative effort. Isn’t that amazing? God made everything we can see on a cloudless night, but it’s when we look at each other that we see his best work. Do you see God’s best work in others? 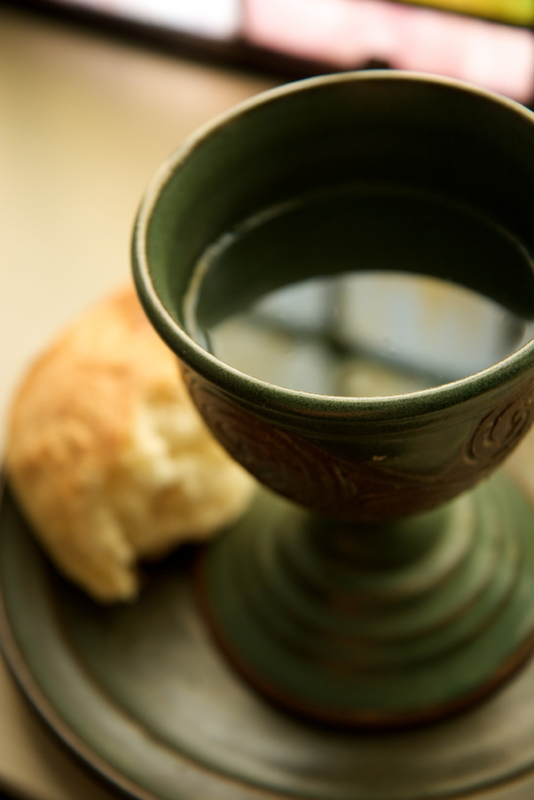 Q&A: What does it mean to take communion? One of the hallmark practices of the Christian church is the celebration of the Lord’s Supper – or Communion, or the Breaking of Bread, or the Eucharist, whatever your tradition calls it. But what does it mean to participate in this unusual ritual? It is definitely a mystery. In fact, simply calling it a sacrament makes it a mystery, etymologically. The Latin word from which we derive the English term ‘sacrament’ comes from a translation of the Greek word from which we derive the English term ‘mystery’. So a sacrament is literally a mystery! What does it mean to participate in this mystery? Based on 1 Corinthians 11.17-34, you can listen to this message by clicking here. This weekend, a special group of people will begin a 900+ km bicycle ride throughout parts of Ontario. They represent the Canadian Bible Society, and will ride their bikes uphill and down, on busy roads and quiet trails, in rain and sun and wind and heat, all because they believe that God’s Word is for everyone. They’ll stop for the night at St. Paul’s, Nobleton this coming Monday, where we’ll feed them supper, provide a worship gathering for them, give them cool air and quiet to sleep in, and feed them breakfast before sending them off the next morning for the next leg of their journey. We are looking forward to the privilege of hosting these great people. Here in the English-speaking world, we tend to take the Scriptures for granted, don’t we? A Bible in our own language is readily available, and it’s legal to own one. Under certain conditions, it’s even permissible to give away Bibles in public places. But for so many people around the world, the Scriptures are not available in their heart language; or, if they are, sometimes it is not legally permitted to possess a Bible. That’s what the Canadian Bible Society exists to do: translate, publish, distribute, and encourage the use of the Bible. These brave cyclists believe in that mission, and in the specific mission for which they are riding this coming week: to provide Bibles to Canada’s military personnel. This is not the first time that Bike For Bibles has put rubber to asphalt for the sake of the troops: it was done in 2007 as well. It’s being done again because of the overwhelming response that Canadian Forces chaplains have received from our people in uniform. Whether guessing about the placement of improvised explosive devices in Afghanistan or protecting Canada’s interests at home, our military personnel need hope, and they find it in God’s Word. We are glad to be participating in this year’s ride by providing hospitality. Indirectly, our hospitality is aiding the comfort of our armed forces and their families. Indeed, every time I hear of another Canadian soldier who has died in Afghanistan, my prayer for the family includes a fervent desire that the young person who died had received one of those Bibles and had read it, engaging with God. “Don’t forget to show hospitality to strangers, for some who have done this have entertained angels without realizing it!” (Hebrews 13.2, NLT). As we welcome these riders and roadies, I hope we’ll be entertaining angels – both those in cycling shorts and those in army boots. How have you entertained angels lately? Q&A: What will heaven be like? One of the questions often posed to pastors and theologians is, “What will heaven be like?” We often wonder if we will recognize our loved ones, and so many other aspects. In this message, we look at several aspects of what heaven will be like – as much as the Bible tells us, which is not very much at all! There are a few texts that we look at, including Matthew 24.36-42, Mark 9.2-8 and Revelation 21.1-4. This was a difficult message to preach, but I pray that as you listen to it, the Lord will encourage you. You can listen to the message by clicking here . Near the end of the message, I cite the poem which is reproduced in the previous post. 1. Heaven will not be b___________________. 2. We will have b__________________ in heaven. 3. We cannot know e____________________ about heaven. 4. Anyone who claims to be able to conjure up the spirits of dead people is either a quack or a child of S___________________. 5. There is an i_______________________ state that Jesus himself called “paradise” where the faithful dead will dwell until the last judgment. 6. It is possible that we may k__________ our loved ones in heaven. 7. Our f___________________ will get much bigger in heaven. 8. Deceased children of b______________________ are welcomed into heaven under the covenant. 9. In heaven, we will have a different p_____________________ on those we have loved who go to hell.